These connectors are perfect for reducing 13mm pipe (16mm outer) down to 4mm pipe (6mm outer), when using large systems. They are inserted in-line at the point where an AQUAvalve or aquaPot is positioned. 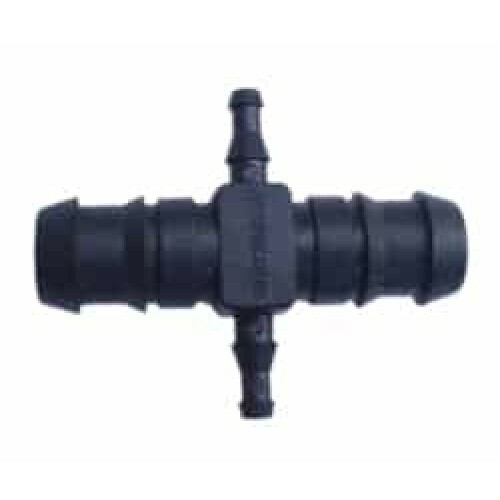 They provide a water tight connection unlike many other types of reduction fittings. Also great for creating D.I.Y dripper irrigation system. High quality 13mm pipe fittings (16mm outer diameter for Autopot System Kits nutrient feed lines and..
13mm Inline Filter13mm Inline Filters are used primarily in autopot system kits and dripper systems ..
AutoPot 1 Pot System KitAutopot 1 Pot System Kit includes:1x 47ltr tank, lid & 6mm top hat gromm..